The Compaq Mini 110c-1010EA netbook provides the great portability, usability and functionality that we've come to expect from HP devices over the years – and all at a very competitive price. The 10.1-inch screen features a 1024 x 576-pixel resolution which isn't the most detailed available, but is still crisp and clear, making documents and spreadsheets easy to view. There's no shiny Super-TFT screen coating, so no reflections to interrupt your work. The keyboard stretches the width of the machine's chassis and, despite its compact shape, is 92 per cent full-sized, providing a fantastic typing experience. The touchpad is large and features a scrollbar which works well. The mouse buttons are located either side of the touchpad instead of below it, however, and if you are accustomed to using one hand to navigate, you may find this an awkward arrangement to work with. The chassis is built from a hard matt plastic that provides excellent protection, although the lid does have a shiny finish which quickly picks up fingerprints. It only opens up a little past 90 degrees, which can lead to a restricted viewing angle. Office performance is noticeably fast, and the 160GB hard drive provides plenty of space for all your files and folders. Portability is excellent, with the machine weighing in at 1.2kg, although its limited 168-minute battery life suggests you'll need to carry the charger with you when you are working away from the office. 802.11g Wi-Fi provides fast internet access when connected to wireless hotspots and the 10/100 Ethernet allows wired connections. The three USB ports are generous and a VGA-out allows you to hook up to external analogue monitors. We really like the Compaq Mini 110c. 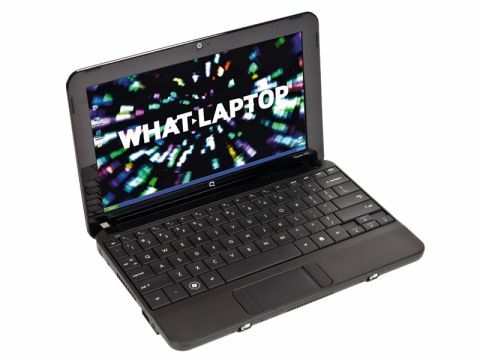 Once again, HP has produced a great netbook which exceeds expectations, and the style, portability and value on offer are extremely difficult to ignore.